I'm pretty sure I read more in the past year than I have during any year in the past decade. One thing I recently discovered about myself is that always having a book to pick up is so, so good for both my head and my heart. This year, I ended up diving into a new favorite genre (give me all the psychological thrillers, please and thank you), discovering my new favorite parenting book (which you can find here) and falling head over heels for audiobooks (which I wrote about here), and absolutely loving a weekly podcast all about what people are reading and should read next (something I never thought would appeal to me). Yes, it's been a good year of bookish things for me. Instead of going through all the books I read and loved during the past year, I decided to instead come up with a list of my nine favorite novels and share them here. This has been a fantastic year of finding really good fiction, which has something that is rarely the case for me. 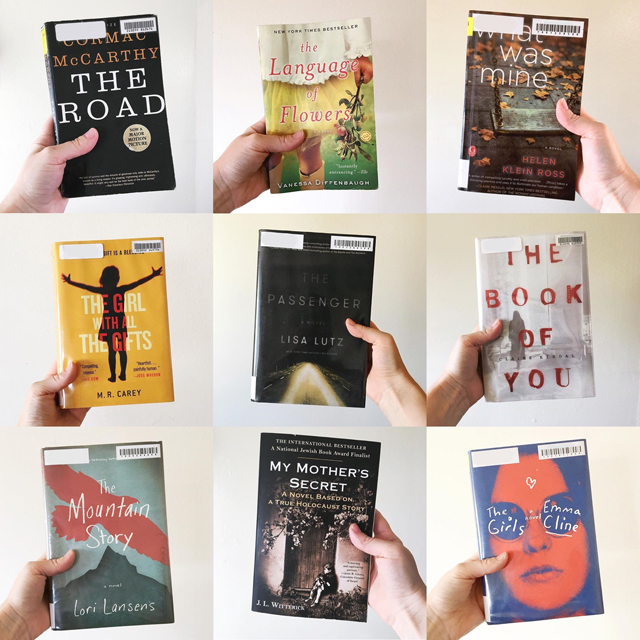 For years, I've been obsessed with reading memoirs or other nonfiction titles, and I never really wanted to put in the effort it took to find fiction that I really enjoyed. After this past year, I'm taking more chances on books that are wildly popular, learning it's totally okay to quit a book I don't love, and also taking note of authors and genres that almost never let me down. Now that I know reading is an essential part of my own self-care (that may sound ridiculous, but it's true) I'm making a point to always be reading something. And it feels good to now have a better idea of what is a good fit. The Road by Cormac McCarthy — This book is one I don't think I would normally be drawn to, but had heard it mentioned on a podcast a couple times. When I randomly saw it at the library, I ended up checking it out, not really knowing much about it at all. (I mostly like diving right into fiction without reading a thorough synopsis or review.) This post-apocolypitc story, centered around a father and his son, is both devastating and beautiful. From what I understand, it's either a book you love or absolutely hate, and I loved it. The writing is poetic and haunting—there's no other way to describe it. Every time I picked up the book, it was like I could lose myself in this other world. It left me with so much to think about when it comes to the depth of a parent's love and need to protect their child, even in the most unthinkable circumstances. The Language of Flowers by Vanessa Diffenbaugh — I picked this one up at a used book sale because it was less than $1 and I thought the cover was pretty. (Plus, the New York Times Bestseller mentions always get me!) Apparently people love this book and I can't believe I hadn't heard of it before picking it up. It is truly a beautiful story. The main character is a woman who ages out of the foster care system, and it made me think a lot about all the unseen and unknown children who face the same fate. My parents began foster care for infants when I was a teenager, and our family was blessed with my two youngest sisters through adoption as a result. This book had me feeling all the big feelings, which was definitely a good thing, I think. What Was Mine by Helen Klein Ross — This is another book I randomly picked up without knowing anything about it, and I was so pleasantly surprised. That, my fellow readers, is one of the best feelings ever. This book tells the story of an average woman who randomly kidnaps a baby from a store (major trigger warnings for those who have struggled with infertility; this book seems to handle the subject in a very raw, honest way). I wish I'd had hours to read this book in one sitting—it was that captivating. One of my favorite styles of writing is when chapters offer narration from a variety of different characters. Although there are many "voices" within this novel, the author does in in a way that made the story so balanced and complete and amazing. The Girl With All the Gifts by M. R. Carey — I heard a bit of buzz about this book before picking it up, but I didn't know much about the actual story. The cover made me super curious and eager to give it a try, and it certainly didn't disappoint! I don't want to say much about the plot because I think it's best to go into it knowing very little and letting each twist and turn surprise you along the way. It's somewhat of a post-apocalyptic thriller, but the characters and presentation of the story felt very unique to me. It had so much heart, given the subject matter. I absolutely loved it and gave up some serious sleep in order to read more of it each day (which is saying something, because sleep is my beloved). The Passenger by Lisa Lutz — This may be my favorite thriller/suspense novel I read in the past year. I believe I was led to this book from a podcast recommendation, but I'm also a sucker for a well-designed cover. This story kept me guessing the entire time and I actually gasped out loud at the end of two different chapters, which I kind of love. Again, I don't want to say too much about this one because this sort of book is best read without knowing too much about the plot (in my own experience, at least!). But it's incredibly well written, and if you enjoy a good thriller, you'll adore this one. The Book of You by Claire Kendal — So, first of all, I don't necessary recommend this book to one and all. Mostly because exactly halfway through, they brought in some pretty graphic (and disturbing) sexual content. There was no indication of anything reaching that level up until then, so it really threw me for a loop. (Perhaps I should have expected it in a book about a stalker?) That sort of graphic content is, shall we say, not my jam, but at that point I was too invested in the story and wanted to finish the book. I skimmed the portions that were making my soul weep and did end up finishing the book and felt it was very good overall, and very creatively written. Just be sure you go in prepared with some light reading afterward to cleanse your mental and emotional palate. Think Berenstain Bears or Goodnight Moon. Or the back of a cereal box. Something with cartoons and happiness. The Mountain Story by Lori Lansens — I definitely cried my eyes out over this book in the best way. I don't remember the last time I had such an emotional response to a book, but this author has such a way with pulling a reader right into the story and creating such memorable characters. (One of her other novels, The Girls, is a must-read. One of the most captivating stories I have ever read.) This book is an incredibly moving tale of survival and family, broken hearts and redemption. Beautiful, beautiful. My Mother's Secret by J. L. Witterick — This book is based on a true story, but is still a work of fiction, so I'm putting it on the list! As a girl, I devoured any sort of historical fiction and was particularly fascinated by stories of children during the holocaust. (The Devil's Arithmetic and Number the Stars are two that I remember having such an emotional response to. Come to think of it, those are two I'd love to reread in the coming year!) This book was recommended to me by my older sister, who is pretty much my book whisperer. (She never steers me wrong. Everyone should have someone like this in their life.) This story is a fairly quick read, but the story will stay with you forever. It is completely beautiful and heartbreaking all at once. The Girls by Emma Cline — This is probably the most popular book I picked up this past year, which probably explains why it took me months and months to finally get a copy from the library. (There were more than 100 people ahead of me when I requested it!) This book is a fictional story based on the Manson cult and murders (different names and characters, but still clearly the same story). It definitely lived up to the hype for me, which was nice! There's a fair amount of sexual content and violence, which aren't my favorite (I skimmed the chapter about the actual crime because I'm pretty sensitive), but this novel was very beautifully-written and rather fascinating. The author is incredibly talented and I'm eager to read more of her work. Are there any books you read in 2016 that you can't stop recommending? If so, I want to hear about them. I need some new books to add to my must-read list for the upcoming year! I should've sent you my copy of The Girls so you didn't have to wait so long! I hated it, haha, so I gladly would've gifted it to you if I'd known you were gonna like it. :) Some of the others on your list are on my to-read list, so I'm glad to see them getting some love. Always makes me want to bump stuff up the list when I see that someone else has enjoyed them! PS: Any good cult/sister wives/Scientology stuff lately? You're the only other one I know who loves them as much as I do! I just finished "My Story" by Elizabeth Smart & thought it was incredibly well done. Thanks so much for your recommendations! I always love to add books to my "want to read" list that friends recommend! I was so intrigued by The Passenger & just couldn't put it down. Have you read Lisa Lutz's Spellman Files series? It's so fun & significantly more light hearted, but still great reads.